My wife and I are on the trip of a lifetime. 10,871 miles traveled to watch the Black and Gold. We are on a 6-week trip in America for our honeymoon all the way from Melbourne, Australia. When we booked our trip we made sure that we would be able to fit in everything we each wanted to do. Luckily for me, my wife is as crazy about sports as I am and we booked in to see all the sports we could. Whilst I love NHL and NBA, nothing can compare to my love for the Pittsburgh Steelers. We watch all the games whenever we can, and we are always dressed in the gear, we even named our german shepherd, “Keisel”. 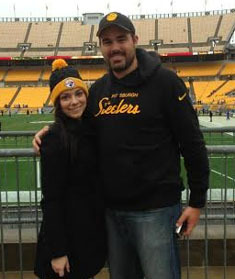 I have been waiting my whole life to get to a game and see Steeler Nation in person, and today my dream was finally realized! *Thank you Dave, and congratulations to both of you! Dr. Ronald Cypher comes through once again with some great photos he took from the stands.